Location: Mouth of Rondout Creek, on the west side of the Hudson River, Kingston, NY. The Rondout Lighthouse is only accessible by boat. Tours operated by the Hudson River Maritime Museum are available Saturdays & Sundays, June through September. Tours leave on the half hour starting at noon. Boat can accommodate six people per tour. 12:00 PM and 3:00 PM tours may be reserved in advance online. All other tours are first-come, first-served with tickets available in the Hudson River Maritime Museum store. Detail of 1845 Hudson River Panorama depicting one of the few known images of the 1837 Rondout Lighthouse at the entrance to Rondout Creek. Built in 1837 by James McEntee, the first Rondout Lighthouse was a direct response to increased traffic on Rondout Creek due to the opening of the Delaware & Hudson Canal in 1828. Built by Maurice and William Wurts to bring coal from eastern Pennsylvania to the Hudson Valley and New York City, the canal terminates at Rondout Creek in Kingston. After it opened, thousands of coal sloops and later towed barges joined the already laden sloops and barges full of bluestone, bricks, cement, and natural ice bound from Kingston to New York City and beyond. The 1837 lighthouse was a two story building made of wood and built near the center of Rondout Creek. Although the exact location of the first Rondout lighthouse is unknown, its wooden structure eventually became unstable, and a new lighthouse was needed. 1867 Bluestone Rondout Lighthouse facing the Hudson River - Port Ewen is behind to the left, Rondout Creek to the right. In 1867 a new Rondout Lighthouse constructed of sturdy bluestone on an enormous stone base was completed on the south side of Rondout Creek off the shores of Sleightsburgh/Port Ewen. This three story stone structure had family living quarters wrapped around a central light tower. Sturdy, comfortable, and very Victorian, just one family lived in this lighthouse for its duration - lighthouse keeper Catherine Murdock (widow of lighthouse keeper George Murdock) and her sons and daughters. 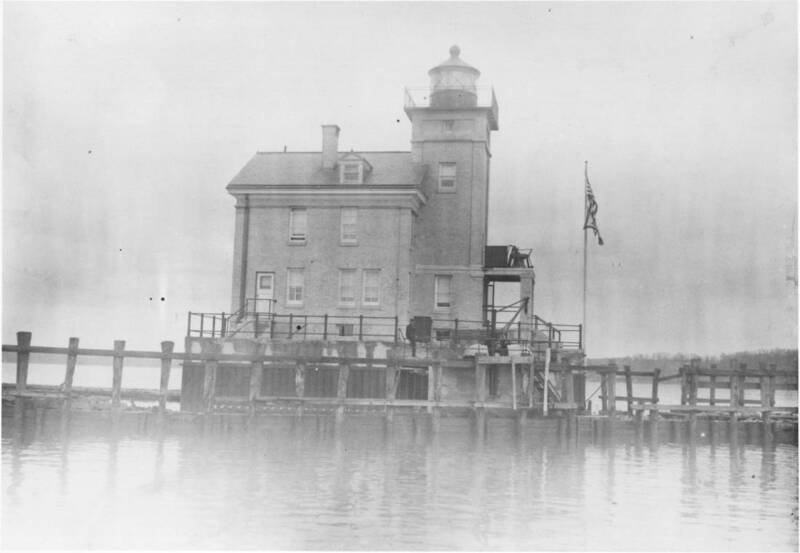 Her son James became assistant keeper in 1880 when the addition of breakwater jetties at the mouth of Rondout Creek meant that Rondout light now had three jetty lights in addition to the tower light to maintain. Catherine retired in 1907 after 50 years of service. James was the first light keeper when the new lighthouse was built on the north side of the creek in 1915. The third Rondout lighthouse was built due to complaints from river boatmen about the difficulty of seeing the new entrance to the creek formed by the jetties. The little lanterns that James maintained on the dikes were insufficient, and the bluestone lighthouse too far back to see, so the new one was built from 1913 to 1915. The youngest lighthouse on the Hudson River, the Rondout Lighthouse was built on time and under budget. 1915 Rondout Lighthouse with the original breakwater barrier. This barrier has since been rebuilt by the Army Corps of Engineers. Here you can see how the breakwater jetties changed the mouth of Rondout Creek and why a new lighthouse was needed. 1915 brick lighthouse center top, 1867 bluestone lighthouse at right near trees. For many years the two lighthouses coexisted - the Old Rondout Lighthouse (bluestone) stood boarded up and slowly deteriorating. Finally, in 1954, the roof caved in completely and the order came down to demolish it. Due to its location out on the water, it was dynamited. In 1948 the brick Rondout Lighthouse was electrified and fully automated in 1954, although the Coast Guard employed a civilian watcher who lived in Port Ewen to ensure the light came on every night. When the last keeper moved out, the lighthouse was boarded up and largely abandoned. In the 1980s, when the Coast Guard was divesting of properties, the City of Kingston and the Hudson River Maritime Museum took ownership of the lighthouse.